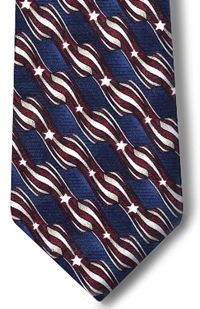 USPS Postal Window Clerk Uniform LONG Stars & Stripes Necktie with Buttonholesk, Red, White and Blue, Polyester Print, U.S. Postal Service Certified. Buttonhole Feature: For a neater and more professional appearance, slide small end of the tie through the loop and button to shirt.